The 23rd session of the Conference of the Parties (COP23) to the UN Framework Convention on Climate Change (UNFCCC) was held in Bonn, Germany, from 6 to 17 November 2017 under the presidency of the Government of Fiji. It is the first time that a COP is presided over by a small Pacific island developing country that is facing an existential threat from global warming. 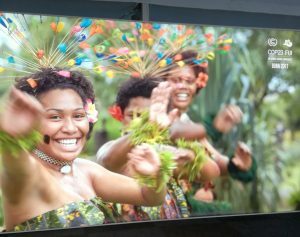 Fiji’s presidency aimed at raising awareness about the situation of Pacific Island Countries that are among the most affected by the impacts of climate change. 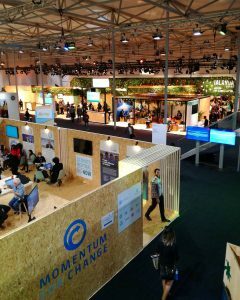 The Conference was organized in two zones: the “Bula Zone”, where negotiations between governments took place, and the “Bonn Zone” dedicated to climate action events (high-level events, side-events, exhibits and delegation pavilions). COP23 had as a major objective to define rules and framework to translate the ambitious goals of the Paris Agreement into action. The Paris Agreement is an international agreement to reduce global warming emissions and limit the increase in global temperature to “well below 2 °C above pre-industrial levels”. It was adopted in 2015 at COP21 in Paris and entered into force on 4 November 2016. The 23rd COP closed on Saturday 18 November, after a night of negotiations, with the adoption of the “Fiji Momentum for Implementation”, a document that aims to advance the implementation guidelines of the Paris Agreement, in order to complete the Work Programme by 2018, and prepare the 2018 Talanoa Dialogue. In addition, the document contains some provisions on “pre-2020 implementation and ambition”. As agreed in Paris in 2015 and confirmed at COP23, the Facilitative Dialogue, renamed as Talanoa Dialogue, will start in January 2018. The word “Talanoa” is used in Fiji and the Pacific to define “a process of inclusive, participatory and transparent dialogue”. The purpose of Talanoa is to “share stories, build empathy and to make wise decisions, which are for the collective good”. The Dialogue is a process through which all countries will take stock of their collective efforts towards the Paris Agreement’s objectives and will revise their ambition in reducing greenhouse gas emissions (their nationally determined contributions – NDCs). The Dialogue will close at the end of COP24 in Katowice, Poland. Several decisions were adopted at COP23, including the decision to operationalize the Local Communities and Indigenous People’s Platform. The platform will be a way to “strengthen the knowledge, technologies, practices and efforts of local communities and indigenous peoples related to addressing and responding to climate change” and to increase their involvement in climate negotiations. Moreover, on 13 November, the Conference adopted the decision to establish a gender action plan to enhance the participation of women in UNFCCC processes recognising their critical role in climate action. Two important initiatives were launched at COP23: the Ocean Pathway Partnership, which highlights the critical relationship between the ocean and climate and promotes action for a healthy ocean; and the Powering Past Coal Alliance, a coalition that aims at accelerating the phase-out of coal in a “sustainable and economically inclusive way”.